The bus struck the shop in Harlsden, north west London, at about 2pm this afternoon. 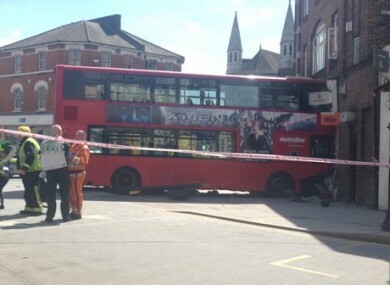 20 PEOPLE WERE injured when a double-decker bus crashed into a shop in London this afternoon. Firefighters from the London Fire Brigade attended the scene and assisted the London Ambulance Service in treating the injured people. Three people were taken immediately to hospital and 17 were treated at the scene. Another nine adults and four children with minor injuries were also taken to hospital. Four people were uninjured but had to be rescued by fire crew using ladders as they were stuck in the shop. Fire Brigade station manager Sam Kazmanli said that people should avoid the area following the crash. The building has been severely damaged so a cordon has been put in place and people have been evacuated from the area,” he said. Firefighters worked quickly to ensure there were no additional casualties. I’d ask people to avoid the area if possible as there is heavy traffic disruption. The London Met Police said that no one had suffered life-threatening injuries as a result of the crash. Email “At least 20 injured after double-decker bus crashes into shop in London ”. Feedback on “At least 20 injured after double-decker bus crashes into shop in London ”.